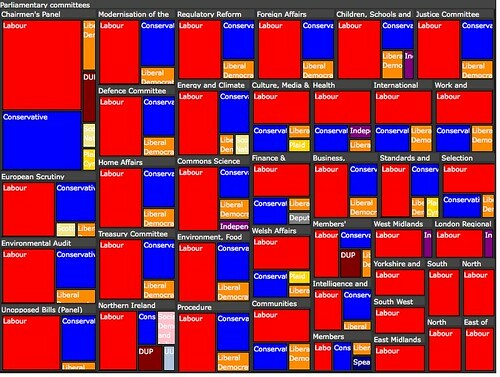 Can’t sleep, can’t work do “proper work”, so I’ve taken the day off as holiday to play out some more of the thoughts and momentum that cropped up during Dev8D… Like this treemap of parliamentary committee membership (as of 1/2/10). And it seems they do – getCommittee will “[f]etch the members of the committee that match [a specified] name – if more than one committee matches, return their names” and for a specified committee “[r]eturn the members of the committee as they were on [a specified] date”. What I wanted was to be able to “select all” committees, which there’s no explicit switch for; but a search on the letter ‘e’ did turn up quite a comprehensive list, so as long as they’re using a free text search, I guess this has the same effect! First up, fetch a list of the committees from the TheyWorkForYou API. Then, for each committee, generate the URL that will pull pack the committee membership on a particular date. For each committee, we now annotate the committee item with the membership of the committee and do a little tidying. 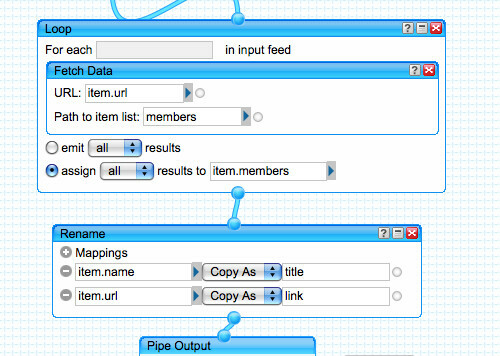 This pipe gives a JSON feed containing a list of committees annotated with the names and ID of committee members. The structure is not totally dissimilar to the structure I used for the Openlylocal committees, so I should be able to reuse that code if I can make the representations match. 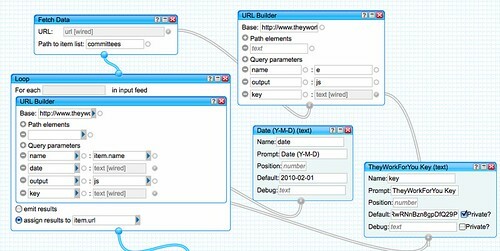 – the TheyWorkForYou list does not have an .id attribute for each committee, which the Openlylocal committee list does have, and which is required for the treemap tooltips to work. First task, then, is to annotate the committee membership list with each member’s party. A call to another TheyWorkForYou API call (http://www.theyworkforyou.com/api/docs/getMPsInfo returns a list of MPs and their party. It was then easy enough to just plug this into the code I’d used to display the Openlylocal treemap. You can see it here. Looking over the TheyWorkForYou API, I guess it would be possible to do a similar sort of thing to map the parties of people who spoke in debates? (I’m not sure if there’s data on votes/divisions with a party breakdown? If so, that would be good to plot too, with hierarchy based on : division, ayes/nays, party, so we could see defections, as well as relative sizes of the votes?